Welcome to the Doctor Who Mind Robber. My challenge, should you care to join me, is to watch all the 800 televised episodes of Doctor Who, from 1963 to 2013, in chronological order and in 50 weeks. That’s right, 50 years of Who in 50 weeks, or an average of roughly 2.3 episodes per day. If that isn’t enough, I’ll then blog about it! This blog is named for my favourite Who serial, The Mind Robber. Will this marathon so rob my mind? Only time will tell! My principal interest in this blog will not be reviewing the episodes, per se, but rather examining the issues of politics, gender, religion and popular culture that arise from them. Special attention will be paid to character development, particularly in respect of the Doctor’s companions. There are a plethora of blogs and review sites that provide excellent standard reviews of Who and I hope not to repeat their content here. It’s my desire that that this blog, in focusing on social and cultural issues, will be a welcome addition to Whovian fandom. A quick note on missing episodes and photos before we embark on our quest. At the time of writing there are 106 episodes missing from 1960’s Doctor Who. This is as a consequence of the BBC’s policy of junking or recycling tapes to save money and valuable storage space. Thanks to the efforts of around half a dozen original fans, the BBC now has the audio of all missing episodes. In the days prior to VCRs and the occasional repeat, the only way to experience Who after its initial airing was to read a novelization of the story, or if you were lucky, listen to the illegal tape that you made on your reel to reel tape recorder. It is from these fan made audio recordings that the BBC has retrieved the valuable audio component of these missing episodes. 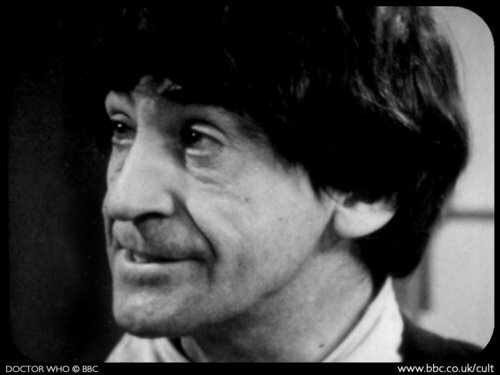 An example of one of John Cura’s telesnaps of the Second Doctor. Photograph copyright the BBC. Eager to experience these lost episodes, fans have made reconstructions of the episodes utilizing the BBC retrieved and remastered audio together with telesnaps and other photographs from the productions. Others have created complete animations of parts, or the whole, of missing episodes. The ingenuity of dedicated fans defies description. Many of these can be found on the internet and the BBC appears to have turned a blind eye to the obvious copyright infringements. After all, it was the BBC that lost the episodes to start with and have the fans to thank for saving the audio! With the exception of the two serials that the BBC has made its own reconstructions of, Marco Polo and Galaxy 4, it’s my intention to complete my marathon by watching these fan made clips. I will also use the BBC produced Shada DVD to watch that never completed or broadcast Tom Baker serial. All Doctor Who serials will be viewed from BBC produced and distributed DVDs and Blu Rays and are contained in my private collection. Rather than resorting to illegal downloading I encourage all fans to watch the splendor of Who legally. In respect of photographs on this blogs most, if not all, would be the copyright of the BBC. No copyright infringement is intended and the photographs are displayed purely for illustrative purposes. I hope you enjoy the journey and would appreciate your feedback. 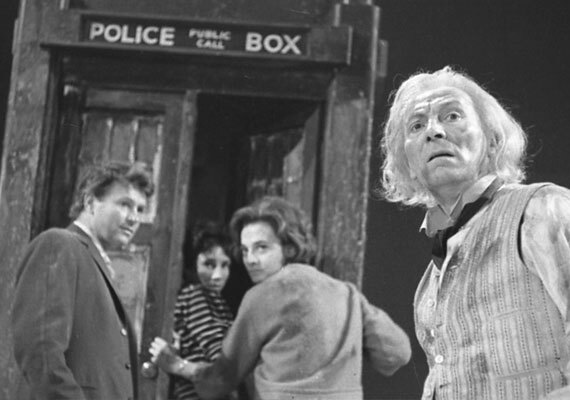 The First Doctor and his companions make a hasty escape in An Unearthly Child. Hi Vivien! What a great idea this is – I’ll probably have a go myself when all the episodes are finally recovered (!). As far as the Loose Cannon recons go, those I’ve seen I really enjoyed because of the combination of inventive reconstruction and having to use my imagination. Just recently saw The Savages and Fury From The Deep and looking forward to the animated Tenth Planet release. Thanks for your comment Mike. I also enjoy the Loose Cannon reconstructions and find them an excellent way of “viewing” the missing episodes. In fact, I become so enthralled by them that I often don’t realize that they’ve switched to a moving picture (a recovered snippet) until it’s almost at the end of the segment! I consider that to be a great compliment to Loose Cannon’s incredible work. I’m up for the Savages in 3 serials time but have quite a while until I get to Fury From The Deep. The Tenth Planet (and its animation) has already been released in The Regenerations Box Set, at least for Region 2. I don’t believe that Box Set is going to be released in Australia, and in any event I have no intention of paying a fortune for the set (which I could get from the UK) when The Tenth Planet is the only serial in the set that I don’t own.Apparently there aren’t any Special Features in the Regenerations Box Set so that’s another incentive not to rush in and buy it now. I’m happy to wait until it’s released on it’s own in November. Unfortunately it means that I’ll have to miss the Tenth Planet in my chronological marathon and get back to it later in the year. Great though the new series is, I do love all the older stuff. Tom Baker, Troughton, Pertwee-need I say more? I drive my wife mad, I best not say anymore. Andy, I have to agree that I prefer the old series to the new. There was better story telling. I bet that was “The War Games” LOL! Thanks for the Joe Orton linkback. I’ve done a Who-athon myself and it took me nearly 2 years, so I’m impressed by your achievement in doing it in 50 weeks.